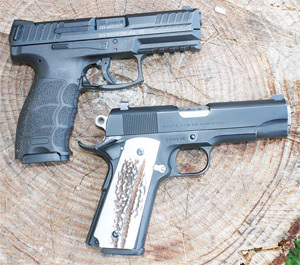 Shop around for handgun grips that fit your hand and your needs. 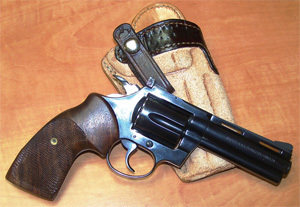 Author’s vintage Colt Diamondback is shown with a pair of Herrett stocks with wraparound checkering for a firm hold. A defensive handgun, or one carried on the trail—or for any other purpose, really—should fit your hand properly to enhance your ability to control the gun and thus allow you to shoot more accurately. Over the years, my tastes have almost immediately drifted away from factory grips to something else. I’ve used Pachmayrs on a couple of revolvers because in the wet Pacific Northwest, those rubber grips are impervious to the weather. They can take a beating on the trail, and for hunting they are certainly top notch. The two deer I’ve killed with my Ruger Blackhawk in .41 Magnum were both taken when that revolver was wearing a set of Pachmayrs. In addition to providing a no-slip surface even in the rain, those grips also soak up some recoil, an important consideration when firing a big bore magnum. Another maker of handsome hardwood grips with classic styling is Eagle Grips. 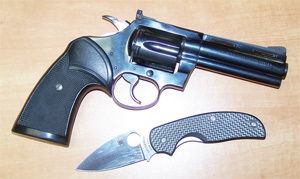 This N-Frame Smith & Wesson takes on a stylish appearance, and Workman found that even under heavy recoil, they are comfortable. A few years ago, I bought a Ruger New Vaquero in .45 Colt, and Raj Singh at Eagle Grips provided me with a set of handsome elk antler grip panels that have, shall we say, seen some country with me. Stag, whether it comes from an American elk or some European or South American critter, makes a very handsome grip material, and it is remarkably functional. The rough surface of an antler also provides a no-slip hold, and since Sambar stag is no longer available—a real pity because Eagle produced some beautiful handgun grips using Sambar that are second to none—we make do with what we can get. 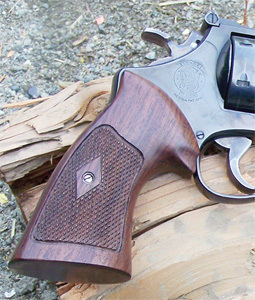 I’ve seen some very handsome stag grips out of Argentina, and even have a set of such panels on a Colt Commander. Not long ago, I swapped a long-serving set of ivory polymer grips that had adorned my Model 57 Smith & Wesson, another .41 Magnum revolver, for more than 25 years. I had been talking with Singh at a SHOT Show and my eye settled on a set of his superb Rosewood Heritage grips. These look very much like the original “Coke bottle” grips offered on the “N” and “K” frame S&W revolvers for many years. Why the company switched to a slightly more squared grip and Goncalo alves as the material some years ago mystified me at the time, and I so disliked them that I sold them, slapped on a set of Pachmayrs for a while and then switched to the ivory polymer set that was made, I believe, by Altamont. But Eagle’s rendition of the Heritage grips is terrific, and seeing them became the catalyst for a look at wood. The set I have is slightly thinner than original stock S&W grips, and they lack the medallion, but they fit my hand very well. Besides, no medallion ever made me a better shot. The left panel is recessed at the top to allow the use of speed loaders, and the checkering is perfect, with the traditional diamond around the screw hole and escutcheon. Eagle’s Heritage grips are nicely finished, and from the side when mounted on an “N”-frame S&W they will remind “Dirty Harry” fans of Clint Eastwood’s centerpiece Model 29 in .44 Magnum. Those of us who favor the .41 Magnum think Inspector Harry Callahan was a piker, but his gun was a real looker. Wood also provides a nice contrast to blue steel. It is far more appealing to the eye than black polymer, and it’s a natural material, same as stag, polished bone or ivory. In wet environments, a good set of Pachmayr rubber grips can save the day, providing a non-slippery grip surface. They also won’t scratch or chip if dropped. On another of my S&W revolvers, a Model 19-2 with the 2½-inch barrel, I mounted a set of Herrett Detective stocks. For that size and caliber of handgun, this grip does rather well and provides a wide enough surface across the backstrap to spread the recoil of full-house .357 Magnums over a wider area of my palm so that the gun doesn’t pound my hand. My Colt Diamondback also wears a pair of Herretts, and I must say that for concealment and shooting comfort, they really do the job. For winter, I can swap those out on both guns for Pachmayrs, or some grips from Hogue, which also produces replacement grips noted for their textured surface. Herein there is a lesson. Handgun grips can be swapped out for seasons and weather conditions, which is why I have more than one set for several of my handguns. For those revolvers on which I’ve mounted wood aftermarket grips, I can swap them in late October or November for the Pachmayrs. In other parts of the country where it doesn’t rain for 30 days straight at times, leaving your wood stocks in place makes sense. Or, as I do on a couple of single-action trail guns I carry during the hunting season, I leave in place the polymer grip panels because that’s another material which is impervious to crummy conditions. One thing the Pachmayrs do that wood replacement grips don’t is they soak up what otherwise might be a nasty gash in the event a gun is dropped or someone takes a nasty fall in wet or snowy conditions. Been there and done that, and it’s not a happy time to see a pair of handsome rosewood or walnut grips take a smack from a rock. I certainly wouldn’t want those handsome Eagle Grips, or the Herrett stocks to take a nasty bang. One can take some precautions with wood grips, of course. If I’m planning to carry a handgun with wood grips in questionable conditions, it takes all of about one minute to give them a wipe with neutral shoe wax (Lincoln or Kiwi) to add a bit of water repellant to the surface. This little exercise has paid off for me in the past, and the wax also adds a bit of stickiness to the surface so you’re less likely to lose your hold. One can see that modern polymer-framed pistols lack something over classics like the Colt Commander when it comes to dressing them up and personalizing them. Lately, Eagle Grips has been offering something rather eye-catching in terms of replacement grip material. It’s called “Kirinite,” and it is remarkable not only for its appearance, but for its toughness. Singh told me earlier this year that Kirinite is not a plastic, nor is it molded. It comes in blocks that are cut, shaped and buffed up, and it can be made in remarkable patterns that are unique because no two are alike. He handed me a panel of the stuff, and I bet you could smack it with a hammer and it wouldn’t break. 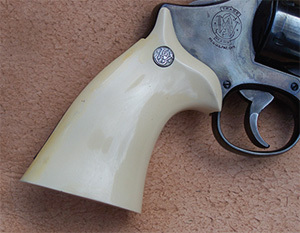 A vintage set of Altamont ivory polymer grips with the S&W medallion long ago found their way onto Workman’s prized Model 57. These grips have seen a lot of landscape over the years, and still look good. He showed me some samples of handgun grips and knife panels. Eagle makes this stuff in all colors, in grips that fit all kinds of handguns, from J-frame S&W models to panels for Colt Government Models. Whether someone chooses Kirinite or stag or wood, or opts for neoprene, there are lots of choices out there and now is a good time to be doing some research. Price and other info online or by phone: Hogue, getgrip.com; phone: 800-438-4747; herrettstocks.com; phone: 208-733-1498; eaglegrips.com; phone: 800-323-6144; altamontco.com; phone: 800-626-5774; pachmayr.com; phone: 800-225-9626.